The 25th Anniversary 2011 Kingdom Day Parade in Los Angeles celebrated the legacy of Dr. Martin Luther King, Jr., with an emphasis on service. That service took the form of teens and their mentors getting out the word that Dr. King’s dream needs the creative drug-free energy of youth to be realized. Narconon Professional Drug Prevention (NPDP) specializing in drug prevention training, Narconon Western United States, both LA-based organizations of Narconon International, Southern California Foster Care Mentoring Network and the National Alliance of Faith and Justice headquartered in Washington, D.C., sponsored the anti-drug banners in the televised 2-mile parade that commemorates Dr. King’s date of birth. Accompanying them skateboarders and break dancers entertained the crowd with their skilled moves. They wore original design tee-shirts. (Click and scroll to see). The design was created by 23-year-old artist, Jose Quevedo, who took top prize in the anti-drug black Sharpie graffiti art battle sponsored by NPDP (Narconon Professional Drug Prevention) at the popular Crewest Gallery in downtown LA. “Drugs Ruin Creativity,” is the title of a section of the booklet, 10 Things Your Friends May Not Know About Drugs, published by Narconon. Curtis O. Porter (2nd from left in our pic below) from the Youth Services Bureau of the Department of Health and Human Services announced the shirt will be displayed in his Washington, D.C., office to exemplify positive youth service. As Director of the Youth Development Division of Family and Youth Services, Mr. Porter administers two of the nation’s most important youth mentoring programs. He attended the parade to congratulate the sponsored mentors and meet some of their youth. He encouraged the work the mentors do to help kids stay off drugs, remain in school and strive to make the dream of Dr. King a reality. “Hearing these youth say ‘I’ve never done drugs,’ and talk about how drugs would stop them from perfecting their skills was strong testament that when youth are encouraged by adults to freely create, they are greatly proofed against drugs,” says Ms. Teddy Chambers, Executive Director of NPDP. “You could sense how excited they were to be able to spread the word that ‘drugs ruin creativity.’ They are very vocal about not wanting their friends or their families involved in drugs,” Chambers added. “It is a real honor to work with people who care enough to give of their time to guide our youth into drug-free productive lives,” said Chambers (far left). 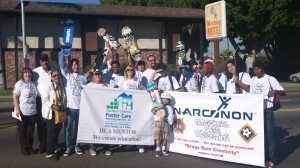 Some of our LA mentors are pictured here. Southern California Foster Care Mentoring Network, headed by Dr. Tina Robinson (3rd from left) provides mentoring through 11 affiliate organizations in greater Los Angeles. It utilizes the Pen or Pencil mentoring program developed by the National Alliance of Faith and Justice to break the cradle to prison phenomenon that too often follows when parents are incarcerated. Heidi Lemmon (5th from left) is a co-founder of Venice Boarding School, which appeals to students’ love of skate boarding to keep them on an academic path. She is President of the National Skateboard Association. Man One (center) is founder and owner of Crewest Gallery in Downtown Los Angeles. He has trained dozens of young artists to help them seek a career using their talents. Fresh (far right), has built LA Breakers, a break dance crew that has mentoring as a core element to keep kids drug-free and healthy.See our skate boarders in action. This entry was posted on Thursday, January 20th, 2011 at 1:18 am	and is filed under Drug Prevention, Drugs in the Community, Kids' Hip Hop Nation, The Positive Art of Hip Hop. You can follow any responses to this entry through the RSS 2.0 feed. Both comments and pings are currently closed.